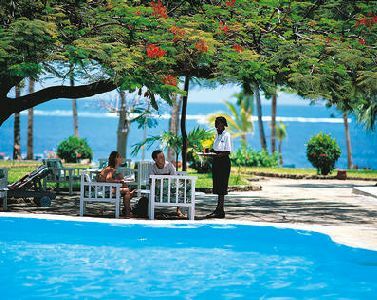 Get a cheap beach hotel accommodation at Coconut Village while on your vacation in Malindi area in Kenya.The Coconut Hotel Malindi Kenya overlooks the environmentally protected Malindi Marine Park and is situated on “Silversand Beach,” just 3 km from Malindi. Coconut comprises 45 rooms, including 12 with ocean views. All rooms of this hotel malindi have been decorated in local Swahili style with queen-size canopy beds fitted with mosquito nets, air conditioning and ceiling fan. For those warm lazy afternoons, there is a typical African sofa on all terraces plus in-room safe box, large bathroom/shower, bidet and WC. The malindi hotel's Coconut Restaurant delights guests with Italian and Mediterranean-inspired style buffets. At the Coconut Pool Bar there ere refreshing drinks, fruits juices, coffee and tea, snacks and pastries and in the evening, cocktails and local spirits.